Never Stop Going for Your Dreams! We often think that adventures are big events and require lots of planning and money. However, it is often the more spontaneous, unplanned actions we take that bring the biggest thrills with them. 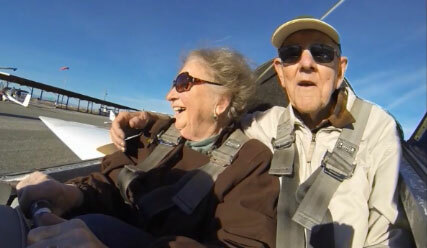 Wayne Hine of Knights Landing, California lifelong farmer, outdoorsman and Itchy Nomad recently surprised his wife Nancy when he purchased a Groupon Deal for a discount flight in a glider plane. He has wanted to go gliding all his life, and he seized the opportunity to do it. If you are not familiar with Gliding, it is a special lightweight plane that has no engine. The plane is towed down the runway by another plane into the air tagging behind the lead plane. Once both planes have achieved adequate altitude the strap between the planes is detached from the tow plane and the glider is left to float silently in the currents until it descends back to earth and lands on its own wheels. Two days later Wayne and Nancy arrived at the tiny glider airport in Williams, California to redeem Wayne’s Discount Groupon voucher to take his flight. At the last moment after some vacillation but not wanting to be left out of the adventure, Nancy, also an Itchy Nomad opted to go too. The planes are tiny and weight sensitive. Calculations had to be done to confirm that the two of them and their pilot would not exceed the weight limit of the little craft. They were given the all clear and with excitement they followed their pilot out on to the runway. Join them on their ride by clicking on the video below. As you can tell, getting in and out of the plane was the hardest part. The entire flight was a peaceful and a thrilling fulfillment of a lifelong desire. This posting is a celebration of our step-Dad, fearless Wayne today on his 87th birthday and to my Mom Nancy for overcoming her fears and going too. They are both enthusiastic Itchy Nomads and have a great attitude of “Just Do It”. Happy Birthday Wayne! Wishing you a fresh year of new adventures. Groupon – A free subscription based service with special offers from businesses based on where you live. We use our Groupon Account as we travel by going into our account and putting in our current location. We are then able to see what special activities and offers are available locally. We mounted a GoPro video camera inside the cockpit of the glider to film the flight. These are tiny, versatile live-action video cameras that do a great job. They are also waterproof and very rugged. We use our flexible Tripod often and in this situation it was the perfect tool to mount the GoPro camera in the glider. Happy Birthday Wayne! you have confirmed that you are an Itchy Nomad and Nancy too. Who knows what next year will bring. Loved watching the video, what a great experiance. May we all be so full of life and following our dreams in our 80s and beyond, like the inspiring Wayne and Nancy! Happy Birthday and MANY more! Thank you Damon, We all must take advantage of our opportunities when they present them-selves. We certainly welcome your comments. If ever there were Itchy Nomads,you two fill the bill with all your adventures sailing on the high seas. Here’s looking forward to more exciting and unusual times.